Laura Cantrell, Banking on a Music Career Laura Cantrell is a deejay specializing in hard-to-find recordings and a singer whose third CD is Humming by the Flowered Vine. She tells Liane Hansen about life as a performer, her role as a musical historian, and her decision to give up her day job on Wall Street. For the past dozen years, in Jersey City, N.J., WFMU listeners have tuned in to hear rare vinyl tracks on a show called the Radio Thrift Shop. The WFMU Web site says "host Laura Cantrell scours the bargain bins, church bazaars and yard sales for those forgotten rekkids of all RPM. Often scratchy, swingy and stringy." But Cantrell is more than a deejay. She's also a singer. Her latest recording is Humming by the Flowered Vine. She tells Liane Hansen about life as a performer, her role as a musical historian, and her decision to give up her day job on Wall Street to pursue a fulltime music career. Humming has songs old and new, including "Letters," a cover of an unreleased Lucinda Williams track. Cantrell grew up in Nashville, but she can't be pigeon-holed as a country singer. 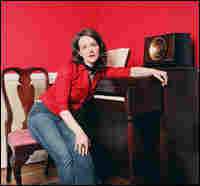 Elvis Costello, who used Cantrell as an opening act, told Britain's Word magazine: "If Kitty Wells made Rubber Soul it would sound like Laura Cantrell."